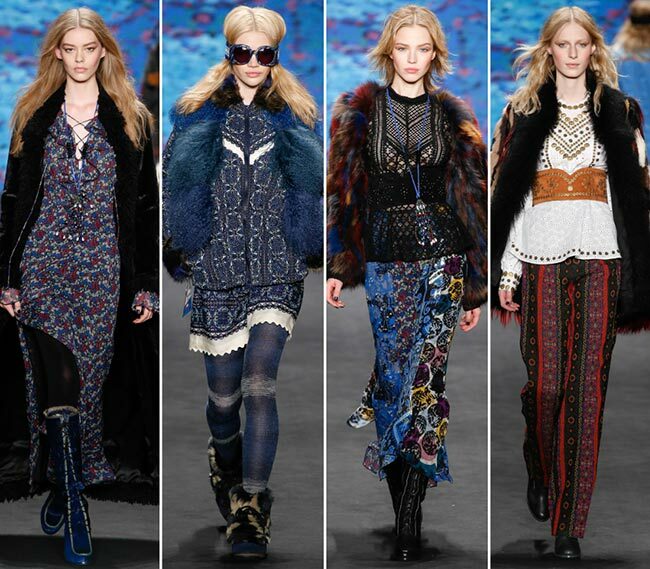 The Anna Sui fall/winter 2015-2016 collection has us thinking “pretty’ over and over again. The 50-year-old American fashion designer is known for her artistic flair, for her ability to create designs that transcend eras and become timeless pieces that will never be out of style. She loves to be inspired by culture and that shows clearly this year as well as there is something distinctively aboriginal about the line-up presented before us. The child of French educated Chinese immigrants who grew up in the American culture, there is no shortage of inspiration for Sui, a woman who has managed to turn her fashion brand into an empire which includes clothing, shoes, cosmetics, eyewear, and accessories, while her fragrances which number eighteen at this point have definitely made quite a splash in that part of the fashion industry. She has been named one of the “Top 5 Fashion Icons of the Decade’ and also received the CFDA Geoffrey Beene Lifetime Achievement Award. Supermodels Naomi Campbell and Linda Evangelista were the reason Anna Sui managed to compete with the power-dressing fashion houses like Chanel, Lacroix and Versace. She has thus become a staple on the New York Fashion Week runways, along with her much anticipated rock music and background designs. Her fans include Blake Lively, Sofia Coppola, Liv Tyler, and Courtney Love, while Naomi Campbell is probably one of her biggest buyers. 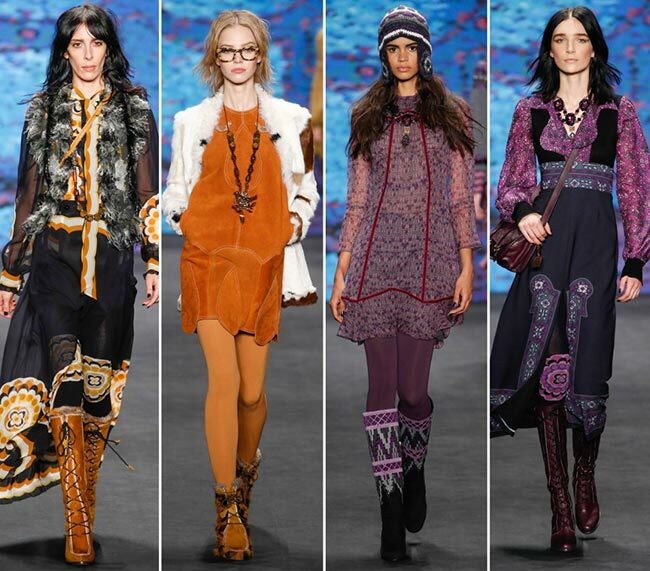 While Sui has definitely taken on the ’70s with full attention, she has skipped over the longer, leaner and more sophisticated designs for something that suits the Woodstock and the hippie. 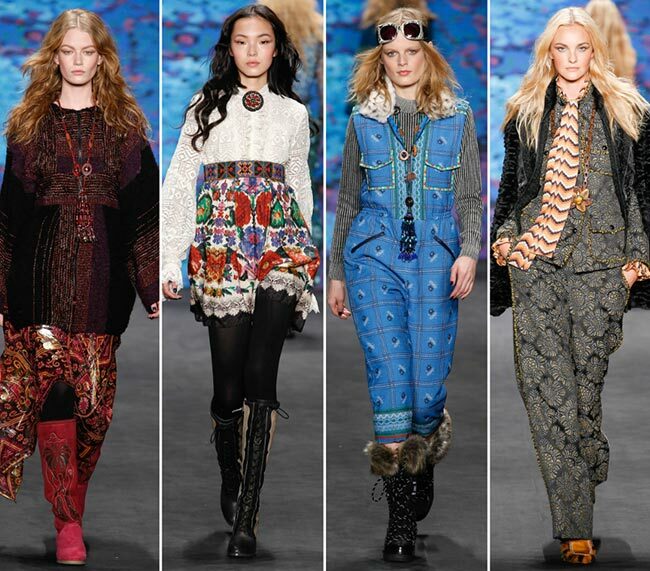 Mongolian fur coats, small leather cross-body bags, flared trousers and so many others make it into the collection. 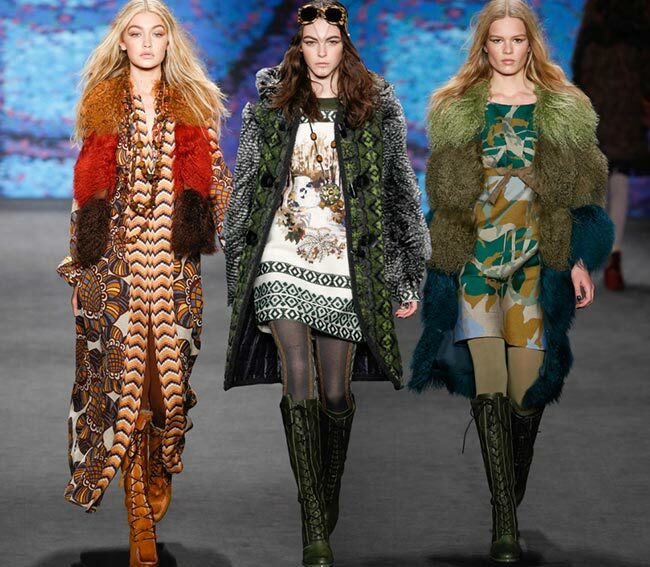 We see knit capes and lots of blues and green color hues. Stockings are a mandatory option, particularly when paired with the baby doll dresses that have the thin fabric and the mega prints. Ivory lace creates both tops and skirts, while the Mongolian turns to Viking as we clearly see some knit horns on some the models that took to the stage. 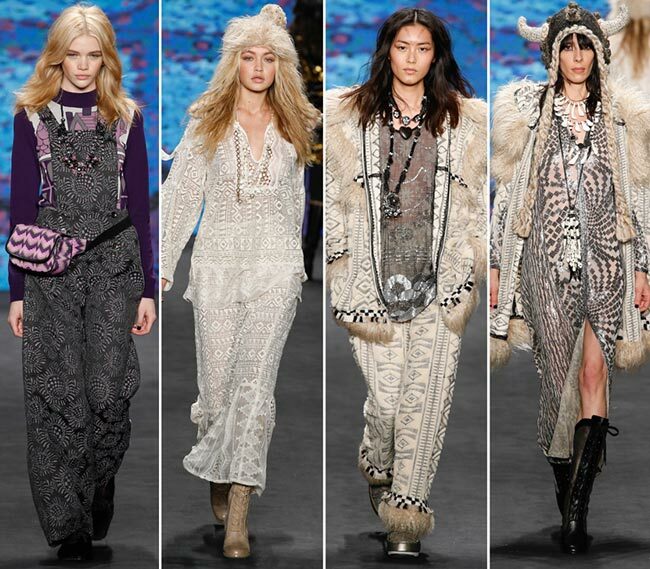 Blonde stunner Gigi Hadid opened up the Anna Sui fall/winter 2015-2016 collection show just hours after she had led the Jeremy Scott collection on the catwalk, this time appearing more in her element with her vintage lacy number and tastefully garnered eye-popping designs in neutral earthy tones. 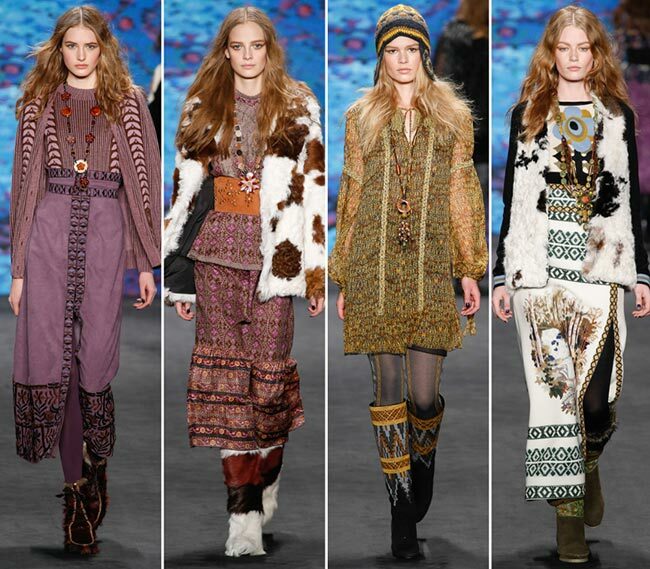 The whole of the collection had lots of velvet and lux fabrics, while striking up a 1970s Nordic Viking vibe. The boots were definitely interesting as well, with some in knee-high fur-lined lace up designs, while others fell lower on the legs, closer to the ankles. We had Aboriginal style embroidery appearing on many across the collection, while others had a distinctively Mongolian influence. There were even tricolor furry animals on the feet, which went well with the lambskin fur coat worn over traditional embroidered designs. We had pants and we had dresses, mini hems and asymmetrical midi skirts, Tunics over the trousers and long ankle length coats, cropped flared end culottes and long, slit skirts. 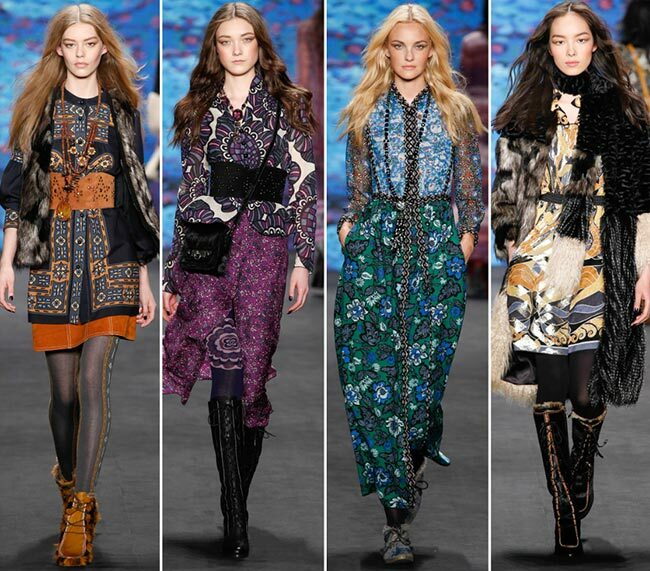 It ended with Viking royalty it seems and we are quite glad to have been privy to such a breathtaking collection.